Sometimes a movie is just so great that you leave the theater knowing that not only are you going to buy it when it comes out on DVD, but that a couple more trips to the movie theater are necessary as well. And sometimes it takes a couple days after you watch a movie for you to decide if you liked it or not, and even then you may not know. USA Films' latest production, "Traffic," can be either. For a lot of the major movie critics around the country, it's the first type. Director Steven Soderbergh is being praised for making one of the best movies of all time, and definitely the best this year. The cast and crew were honored with five Golden Globe nominations, and are sure to be mentioned a few more times when Oscar comes calling later this year. But we all know about the guys that pick the Oscars and Golden Globes and such. They prefer movies that stimulate the mind to thinking "outside the box," so to speak, and tend to shun movies with a great plot and great acting but little philosophical value. Every so often, a movie such as "American Beauty" comes along, which does both beautifully, and Oscar eats it up. However, a good number of times a movie such as "The Thin Red Line" will land on the awards shows. While it may have been great to your average, run of the mill Harvard professor, all that it was to a majority of the American viewing public was a chance for a few extra hours sleep. And while "Traffic" is not nearly that boring, it is by no means the best picture of all time, for the year, or even this season. As is usually the case, the plot is a good place to start. There are a lot of different story lines in the movie. The main one centers around Judge Robert Wakefield (Michael Douglas), a conservative Ohio judge who is chosen by the President to be the new "drug czar." Wakefield tackles his job full-force, until he discovers that his daughter (Erika Christensen in her first major role) is a drug addict. The second- and third-string story lines focus on two pairs of drug cops, one pair from Mexico and the other from the United States. Yet another tangent involves the bust of a very wealthy businessman for drug trafficking. Except for the cops playing a minor role in the arrest, none of the story lines seem to have anything to do with the other until the last 10 minutes of the movie. The production quality of the movie is another factor that starts to play a major role midway through the 2-hour, 20-minute movie. While focusing on Douglas' character and the United States, everything is in full color. But when the scene shifts to Mexico, everything is brown. The plants, the cars, the sun--everything. There is probably some huge "purpose of life" statement that can be made from this, but all it really does is annoy the hell out of anyone who isn't colorblind. black and white may have gone out in the 60s, what "Traffic" does not lack is great acting. This cast is one of the best ever assembled, and the performance they turn is definitely worthy of major awards. 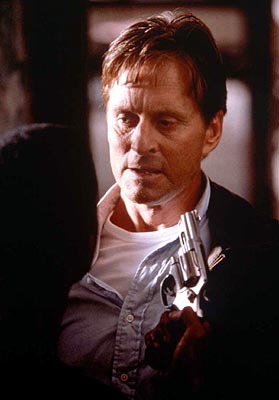 Michael Douglas is great as the closest thing to a main character. Don Cheadle ("The Family Man") and Catherine Zeta-Jones ("Entrapment") are outstanding as one of the U.S. drug cops and the arrestee's wife, respectively. But the best job in the movie is turned in by Benicio Del Toro ("The Usual Suspects," "The Way of the Gun") as one of the Mexican drug cops. Del Toro's character unknowingly begins working for a large Mexican drug cartel, and is forced to make a big decision after the cartel murders his partner. Whether or not you will like "Traffic" depends largely on what type of moviegoer you are. If you're the sort who goes to the theater on a Friday just to unwind from a long week, and you don't like to think a lot during your movies, then you will probably leave the theater overwhelmed by the acting but dissatisfied overall. However, if you like the "Thin Red Line" type of movie, which starts and ends very slowly and makes a huge political statement, and you don't care about a lot of action, then you'll be very happy with it. But no matter what type of movies you like, "Traffic" is worth watching for two reasons: 1) to see brilliance in motion through Douglas, Del Toro, and company, and 2) to make your own decision about one of the most hyped-up and talked-about movies of all time.